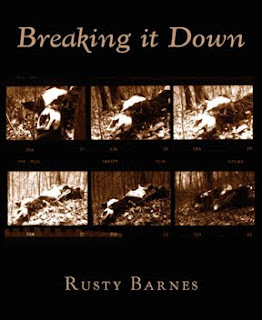 I'm making a final push--well, maybe not final entirely--to sell copies of my collection of flash fiction, Breaking it Down, from sunnyoutside press, under the stellar publisher/editor David McNamara. You can see reviews and interview links here on the publisher's page, or on Goodreads. It can be purchased through sunnyoutside or on Amazon, though it's always better to order from the publisher in the case of small presses. I feel a little odd promoting this on my blog dedicated to poetry, both mine and other folks, but it's my personal blog too, more or less. And if flash fiction is not your bag, baby, later this year I'll have an as-yet-untitled collection of traditional-length stories out, also from sunnyoutside, as well as a decent-sized chapbook of my poetry, which I'll be self-publishing under the Fried Chicken and Coffee moniker. Why? Because I can. Because likely no one else will. Because I want to make it purty. Because I want the opportunity to do other people's chapbooks of poetry, too, and I figure I'll iron out the process and any mistakes on my chap rather than someones else's. Enjoyed your flash so much in Wrong Tree Review. I ordered your book and will be back when it arrives (and thanks for the tip on ordering from the press).